If you’re homeschooling a high school student, you’re probably aware that you’re eventually going to need some basic tools to help your child receive credit for all of their hard work (and yours!). Looking for the needed documentation and trying to know where to start can feel a bit scary and overwhelming! But I promise that once you know what to do, it’s a pretty simple and straightforward process. My daughter and I recently spent some time looking around online and found some great resources. We want to share them with you to help take you through the entire process of having everything you need for your homeschool student to graduate – for FREE! Before we get started with resources you do need, I want to talk about the GED for just a minute, because a lot of homeschool moms ask about it. If your child did not complete graduation requirements, a GED may be a good option. Keep in mind, however, that a GED is generally for people who did not complete high school, and many potential employers will value a diploma over a GED when they’re looking at a resume. If you’re considering a GED because you’re concerned that you don’t have “official” documentation, then have your child take an annual standardized test like the CAT. You can also sign them up for the SAT or ACT (or both!). If your child has done the work to receive a diploma, don’t be scared of the process! That’s why I’m here today! Bonus Tip: I recommend having SAT & ACT scores along with a transcript & diploma for your homeschool graduate. As a homeschool graduate myself, these are the documents that are the most important to me personally, and probably to a lot of other homeschool graduates, too! Keeping good records as you go will make everything else we’re going to talk about really easy to accomplish! But, if your child is a senior and you haven’t kept good records, don’t despair – you can still put a solid transcript together! Start by reading Joan’s incredibly helpful & thorough post about adding up what classes your child has taken, then come back to this article to see what to do next! This FREE downloadable gradebook & attendance chart by Five Js is a great one that I’ve successfully used in my own home! 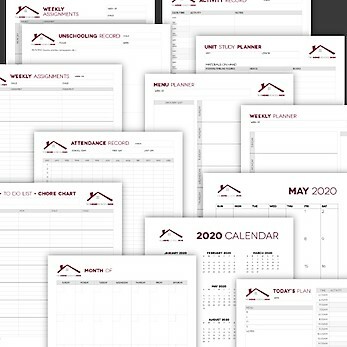 The printable homeschool & household planner pages from The Homeschool Mom is a very comprehensive planner and record keeper. The digital homeschool planner with a transcript template from The Homeschool Mom is another very comprehensive FREE option. Even though you are not required to have the same classes as public schools, I highly recommend meeting or exceeding the college prep graduation requirements in your area, just to keep the doors open for your child. To know what those requirements are, simply google for “(your state) graduation requirements” and make notes of what shows up on a .gov site! Bonus Tip: If you’re feeling confused about graduation requirements, don’t be afraid to ask a local school administrator or public high school parent for clarification. That’s what I did and it was a beautiful experience of parents, teachers, and administrators dropping personal feelings and convictions to offer valuable information because they love my child and genuinely want to see her succeed! As a homeschool graduate who’s now homeschooling my own upcoming high school student, I’ve found that I much prefer the transcript to be categorized by subject instead of grade – this way, if a particular class takes more or less than a standard school year, it’s easy to keep the transcript clean and simple. After looking at a bunch of options, my daughter and I chose this FREE transcript template over at servingdaytoday.com – it’s clean, simple, easy to use, and it looks very nice! Since it’s not necessary to have ACT and SAT scores on a high school transcript, you can simply delete those lines if you don’t want to include test results. Unless every class your child takes is exactly 1 credit, calculating the GPA can get a little tricky, so I recommend utilizing this free GPA calculator. It was incredibly easy to use! If you have anything below 1 credit, you can just type it into the space, re: 0.5 or 0.25 . I didn’t bother listing class names, and it gave me the GPA plus the number of credits earned. Very handy! Bonus Tip: You can click the little tabs at the top of the calculator to calculate grades, too! There are so many diploma options out there! You can find great FREE templates to make your own diploma, like these ones on Canva, but I personally really like the professional-looking diplomas from homeschooldiploma.com and they start out at just $29.99! You can add fun things like wallet sized diplomas, tassels in your choice of color, cap & gown, etc. but of course those are all optional! Add as many or as few of the items as you want, but have fun looking over all the choices! Bonus Tip: If you select the personalized diploma at homeschooldiploma.com, which starts at $35.99, you can choose a seal, diploma wording, optional verse or motto, etc. so I recommend taking a peek at that one to see if it’s something you want to pay a few extra dollars for! I hope this resource guide has been helpful to you! If you know of any additional FREE or very frugal helpful resources for homeschool graduates, please share them in the comments! Curious about a homeschool graduate’s thoughts? I spill the beans about my own homeschool journey in this post. Shouldn’t our kids be salt & light? Find out why I think homeschooling often allows for more opportunities than private or public institutions to be just that. Simplify Your Homeschool Routine video masterclass – for the mom who’s driving herself mad with worry about possibly ruining her kids. 5 books that will help you slow down, savor time with your kids, and rediscover your love of homeschooling. I’d love to hear: What resources have been helpful to you as you prepare for your child’s graduation? Or, if you’re a homeschool graduate yourself, what do you think homeschool moms need to know? Tell us in the comments!